The Dragon Dream Team is a unique support group that gives a new face and meaning to breast cancer survivor. Members are women of all ages and backgrounds, from newly diagnosed to long-time survivors. 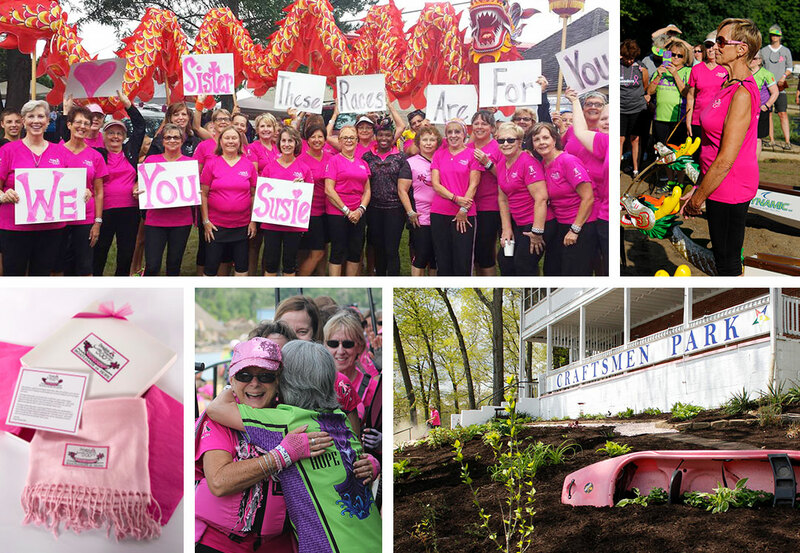 When this team came together in 2007, it joined the more than 200 such groups and thousands of survivors around the world that discovered a pink dragon boat and the camaraderie of sister survivors could be the key to finding wellness and an active life after breast cancer. The Dragon Dream Team began ten years ago with the efforts of breast cancer survivor, Jessica Mader, and her doctor, Akron plastic surgeon, Dr. Douglas Wagner. During the summer months, 76-year-old Jessica was a member of a BCS Dragon Boat team in Nova Scotia. Back in Akron, her enthusiasm and positive attitude while undergoing cancer treatment inspired Dr. Wagner. He offered to purchase a full size 20-paddler dragon boat, challenging Jessica to invite other breast cancer survivors to “get on board”. The boat was named Rex Dream. As the team continued to grow, it became evident that a second, full-size dragon boat was needed and this boat, named Rex Hope, was purchased in 2010. In 2016, to celebrate its 10-year anniversary, the team added a mini 10-person boat, named Rex Love. Research strongly suggests that physical activity not only has a positive effect on the quality of life following a diagnosis of cancer, but may improve and enhance survival. In 1995 Dr. Donald McKenzie, a Sports Medicine physician at the University of British Columbia, set out to confirm that notion with the very first breast cancer survivor dragon boat team. The results were staggering. Through the camaraderie and sport of dragon boat paddling, Dragon Dream Team members are empowered to take back their lives and move forward in the spirit of fun, friendship, health and wellness. The Dragon Dream Team competes in local, national and international festivals and has raced in two world championships. Since 2013, the Team has hosted Dragons on the Lake Dragon Boat Festival to create breast cancer awareness and support. The event at Portage Lakes State Park brought together 1000 corporate and community paddlers and participants from the northeast Ohio area. Off-season activities include winter fitness, participating in events to support Breast Cancer organizations, organizing our major annual Breast of Friends fundraiser and attending spring training camp in Florida. Raising awareness and giving back to the community is an important part of the Dragon Dream Team’s mission. Boatloads of Hope is an outreach program for breast cancer patients, especially those coping with the challenges of treatment. Each year, hundreds of newly diagnosed survivors receive a silk pashmina embroidered with a dragon boat logo and a personalized message of hope from the Dragon Dream Team. Boatloads of Hope is now in 17 northeast Ohio hospitals and cancer centers. From May to the end of September, we practice three days a week at Craftsmen Park, located at 4450 Rex Lake Rd, Akron, OH 44319. We share a boathouse with the Portage Lakes Rowing Association. Team practice season begins in May and ends in October. Specific times and experience levels are listed below. New paddlers will be asked to sign a waiver and will be fitted with a paddle and a personal flotation device.